Is that a terrabyte in your pocket? No, it's half! If you sometimes tell ladies that you’ve got the world’s biggest one in your trousers, you’ll now be able to say it without lying. Storage manufacturer Buffalo has launched a 500GB pocket hard drive, which it claims is the world’s most capacious unit of its kind. The 5400rpm external drive, dubbed the HD-PS500U2, tramples over the existing record for the world’s largest 2.5in pocket hard drive by 100GB. 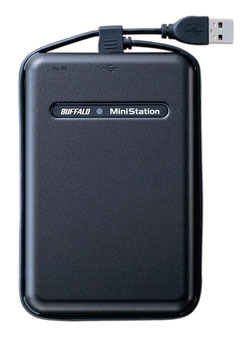 The 500GB drive is part of the MiniStation TurboUSB range, which features a tough outer casing and shock-absorbent internal design, Buffalo said. It's powered through a USB 1.1 or 2.0 connection, and its casing allows the USB cable to wrap neatly around its exterior when not in use. Buffalo said the drive is Windows and Mac compatible, including with the recently launched Mac OS X Leopard. Windows users have the added benefit of Buffalo’s own encryption software, although the drive is compatible with Apple's Time Machine back-up system. Buffalo’s 500GB MiniStation TurboUSB hard drive is available now in the UK for around £155 (€195/$300).